No matter how far away from Texas I get I always find influence the great state has on other people’s culture. 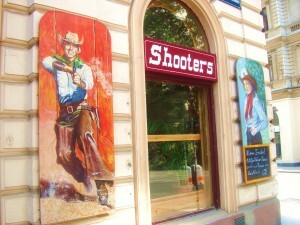 A visit to Vienna Austria last year provided ample opportunity to hang out in a Texas-influenced bar called Shooters. All manners of Texas ephemera were tacked up and a variety of menu items claimed to be “Texas style”. When I get more than 4 hours away from Mexico I don’t eat Mexican food and when I’m in Central Europe I typically don’t eat chicken fried steak and Texas toast. This entry was posted in Texas Daily Photo and tagged texas, Texas Daily Photo. Bookmark the permalink.